This is the book we started in Maine, last Fall. We would leave our little nest of a home in Portland to explore the coast, and find adventures, then by nightfall we were back in the cozy spot where this book awaited us. Now, we are picking it up, again, Jonathan Strange & Mr. Norrell.... maybe because it rained all day, maybe because we were all together and enjoying our fireplace, eating the last of our homegrown apples. 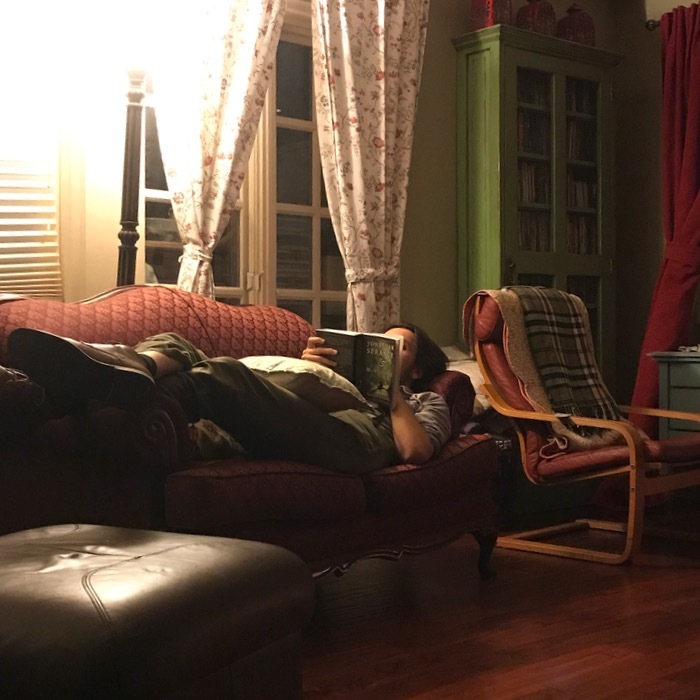 Whatever the reason, I am grateful for the warmth and serenity of family time, of soft light, comforts, and a good book, for a moment's relief from the news, the weight of hate, fear, disquiet. Grant us peace, all, and the loving kindness to share comforts, and light. Seeking comfort, returning to the things, the times, the feelings that keep us safe and connected; exactly the kind of healing responses we all need. 15~ "Love casts out fear..."